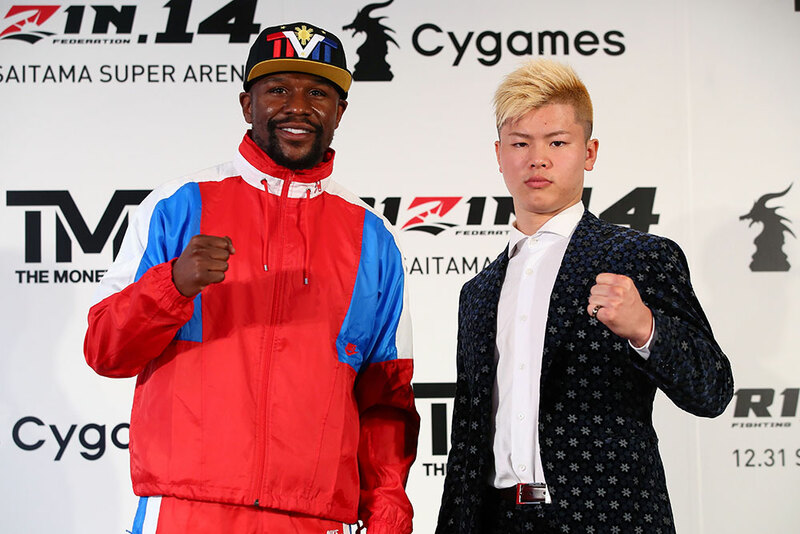 On Wednesday, Nov. 7, Floyd Mayweather Jr. released a statement on his Instagram account where he claimed to not have agreed to an official bout with Tenshin Nasukawa. Mayweather and Nasukawa appeared in a news conference on Monday, Nov. 5 (Sunday in U.S. time) in Tokyo streamed worldwide in which a fight between the two would be held on New Year’s Eve at Rizin FF 14. However, it appears that Mayweather will remain retired for now. Rizin Fighting Federation is a Japanese promotional company, founded in 2015, that puts on MMA (mixed martial arts) and kickboxing events. 20-year-old Nasukawa is one their rising stars holding a 27-0 record in kickboxing and a 4-0 record in MMA. According to Mayweather’s statement on Instagram, he had not heard of Nasukawa before the news conference and believed that their bout would be a non-televised private exhibition held in front of a “small group of wealthy spectators”. He claimed to have been blindsided by the announcement and that he was misled into the true nature of the fight. He said that he went along with everything that was going on in the news conference as he did not want to create a disturbance. Fans can agree with the confusion due to the unspecified rules announced for the fight. It was reported as early as Dec. 20, 2017 by ESPN that Mayweather was in discussions for a UFC (Ultimate Fighting Championship) deal. A month later, TMZ reported that Mayweather had begun training at a MMA gym creating the idea of him in the UFC octagon a reality rather than a fantasy. However, he has not officially signed with the UFC yet, but his interest still remains if he was going to fight Nasukawa. Combat sports fans on social media speculated on how much of a stunt the Rizin news conference was. Rizin president Nobuyuki Sakakibara has not released an official statement in regards to the New Year’s Eve fight, and Nasukawa has remained silent as well. MMA journalist Ariel Helwani claimed on his ESPN+ show, “Ariel and the Bad Guy”, that only Rizin and Nasukawa have something to gain from this affair. More people now know more about Rizin and Sakakibara and Nasukawa’s faces are known to more people now than they were before last week. The only comparable situation that can be cited is a potential 2003 fight between Mike Tyson and Bob Sapp. Tyson confronted top K-1 fighter Sapp in the ring after his victory against Kimo Leopold. K-1 signed Tyson to a contract, but the fight never happened due to Tyson’s inability to obtain a visa to enter Japan because of his felony history. The fight never happened, but fight fans still wonder what a mega fight like Tyson vs. Sapp could have done for the legacies for each fighter. The same can arguably be said for Mayweather vs. Nasukawa. The age difference in this potential fight (21-year age difference) is much more greater than Tyson vs. Sapp (seven-year age difference). Age does not always matter in MMA. Legendary fighter Fedor Emelianenko is still fighting at age 42, and UFC Hall of Famer Chuch Liddell (48) is making his return to MMA against long-time rival Tito Ortiz (43). However, a boxer making the switch to MMA could prove difficult for Mayweather if he ever makes the jump. All fight fans can do is wait and read the rumor mill as it appears Mayweather will remain retired until another big money fight comes his way.